OK, so imagine your worst nightmare. Then reimagine it starring an angry gorilla. No matter what you just conjured in your brain waves, I'm guessing it wasn't half as terrifying as this zoo gorilla who cracked the window glass while charging at a family this week. The dad of the family shared the terrifying encounter on Reddit, and let me just say that somebody at the Henry Doorly Zoo in Omaha has a lot of explaining to do. That gorilla went from zero to murder face in less than a second, and that glass crumpled faster than any wine glass you party-foul broke in college. What makes this a little more terrifying is that it's not super uncommon. Apparently a lot of zoos have splinters in the glass from gorillas rushing at people. They say that it is mostly triggered by humans mocking or threatening gorillas on the other side of the window, but in this case in particular, the dad of the family says that they were doing neither. 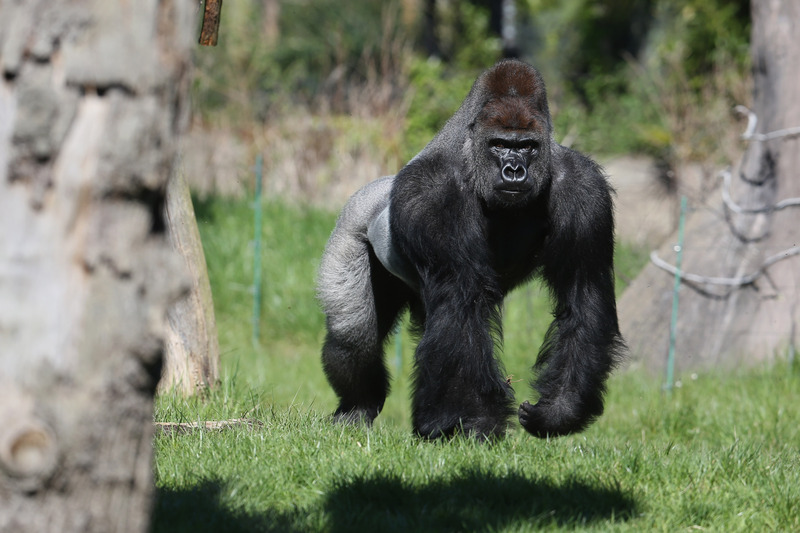 According to the dad's account of events on Reddit, a zoo employee allegedly told him that the male gorilla had been in a fight with another gorilla shortly before their arrival, which is why he had a cut on his eye, and why he charged at them the first time. What we saw on video here was the second time he charged them, and consequently broke the glass. You can legitimately see the terror in this family's eyes through the reflection on the glass. Making this even more harrowing, the dad shared that as they were running out, they realized all the doors were automatic. Automatic doors aren't so discerning about opening themselves up to blood-hungry gorillas, so yeah, I'd be freaking out, too. Fortunately, the gorilla didn't make it out of the exhibit, and everyone is safe (and freely storytelling on Reddit). Humans share 98 percent of our DNA with gorillas, so it should never be a surprise when a gorilla who has been locked up and put on display in a zoo reacts just as we would—with boredom, frustration, anger, and even psychosis. The only surprise is that incidents like this one don't happen more often. Zoos simply can't come close to matching the space, diversity, companionship, and freedom that animals enjoy in the wild, and that's why PETA's motto reads, in part, that "animals are not ours to use for entertainment." You can read more about PETA's mission to protect animals in zoos here, and read more about the family's comments on the experience at the original Reddit thread.